Fly-fishing is the oldest method of recreational angling, dating back to approximately 200 CE, with its roots in Macedonia. The first references to fly-fishing in Europe are found in the accounts of English writers of the 15th and 16th centuries. Fly fishing became a really popular form of fishing in Europe and elsewhere over the last 400 years. Many devotees are women, and the history of the sport has many female contributions. Three American women in particular have greatly influenced the sport of fly-fishing: Mary Orvis Marbury compiled the first definitive book of fly patterns in 1892; Helen Shaw introduced innovative fly-tying techniques during the 1940s and ’50s; and Joan Salvato Wulff was one of the world’s finest casters, setting many records in the 1950s and ’60s, as well as being a noted writer on the subject. From its beginnings as an angling method primarily for catching trout and salmon, fly-fishing has grown to include many different species. Freshwater fly anglers catch bass, panfish, pike, and various species of perch. Saltwater fly-fishing continues to grow in popularity for such species as striped bass, bluefish, permit, bonefish, and tarpon. and fighting and landing hooked fish. It’s all about problem solving, one step at a time and perfecting each step towards fishing. Sustainability of rivers depends on responsible anglers to take care of the natural balances, therefore we recommend practising the sport with a catch & release philosophy. As George LaBranche, american angler explained many years ago, the position of the fly on the water is what ranks first. Second, the action of the fly. Third, the size of the fly. Fourth and fifth, the form and color of the fly. Fly fishing is the act of tricking the trout that it is actually about to eat a fly. All actions an angler performs, are focused towards achieving this single goal. Why do it? 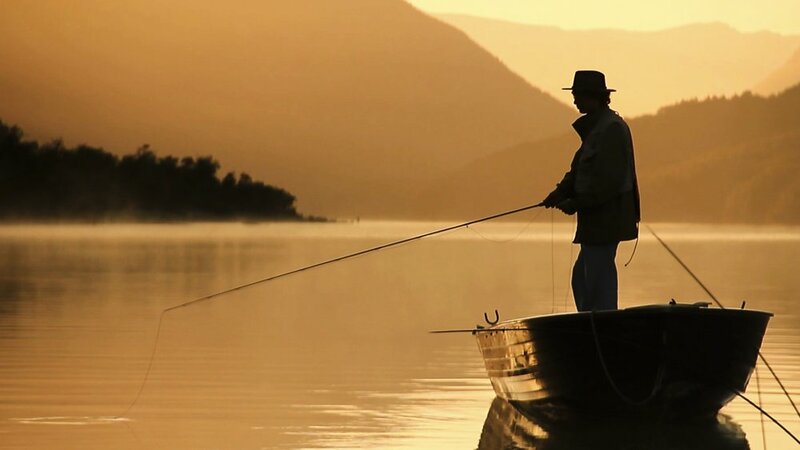 Practising fly fishing entails a deep connection with nature, at points getting to a state of mind similar to the one achieved with meditation. It is about perfecting the actions to “trick the trout”. It is about merging yourself with nature, the river, keeping yourself silent, unseen. How to start? Casting is an integral part of fly fishing, because of the importance of techniques and the variety of approaches. While there are not many different ways of casting a spinning rod, there are dozens of different techniques to present your fly in the most natural looking way. To make things easier, we would absolutely recommend that you take casting lessons first, before heading into a fly fishing river adventure. — Yvone Chouinard, surfer, kayaker, falconer, climber, fly fisher and Patagonia Inc founder and owner. — Richard Ameijeiras, well known fly fishing guide based in Patagonia (Bariloche, Argentina). The equipment shouldn't be on the list of your worries in the beginning. It is affordable and easy to purchase in fly fishing shops and online. As said, we strongly recommend using rented gear in the beginning coupled with lessons and guided experiences. The fly fishing language has some technicalities that you’ll have to learn and understand as you get more in to it. Back-cast: means casting the line by throwing it backward first, then letting it unfurl and casting it forward after that. Buzzers: refers to flies or insects which fly over the water. Cover: casting towards a spot with plenty of fish. Cast: the motion of “throwing” the fly rod. Drag: it is the unnatural motion of the fly, that’s caused by the current on line and leader. Fly: artificial lure that attracts fish by mimicking a native insect or getting their attention with bright colors. Leader: line that is usually made of synthetic material, to which the hook is attached. Fly Reel: it is the object that holds the line. It comes in different types depending on the material and function. Fly Rod: Rod that it is used for fly fishing, usually made of graphite, bamboo or fiberglass.